The gist: The people at the top of their games are the ones who kept the right mindset through all the failures along the way. There’s nothing like the feeling of being recognized by someone you admire—the validation you get learning someone you respect also respects you. I imagine that’s how Tom Toro felt when he sat down at his mother’s computer on his 28th birthday to find an email from The New Yorker with the subject line, “Cartoon Sold.” He’d done it. Tom got his first cartoon into a major publication. I don’t know what he did that night but, considering it was his birthday, hopefully there was some celebration involved. But, before that acceptance letter? Rejections. 609 of them, to be exact. For more than a year, Toro drew a cartoon every day and sent it off for consideration by the magazine. He did it from the kitchen table at his parents’ home. He lived there—nowhere else to go after dropping out of film school with a mountain of debt. Imagine yourself in Tom’s shoes—completely changing your life path, working through bouts of extreme depression, and bills piling up as fast as the rejection letters from the people who held his future in their hands. Most of us wouldn’t have the stomach for it. As the failures piled up, you’d start asking yourself, “Should I be doing this at all?” And you’d likely decide—emphatically—”no” and move onto the backup plan (if you had one). But Tom persevered. Despite the hundreds of rejection letters that collectively said, “Maybe you should reconsider this career path,” he kept going. He kept going because he knew something about failure that many never realize: he only had to get one yes to erase all the noes and getting that yes was completely within his control if he carefully analyzed each failure. Tom knew that success was a mindset. If you told me you wanted to become a doctor, and I said you couldn’t, would you give up or would you keep trying? The answer, interestingly, is neither one or the other. The action you choose—to keep on or to quit—depends less on me telling you that you can’t be a doctor and more on the reason why. What the body of research surrounding motivation, perseverance, and performance seem to show over and over is that how you recover from failure depends on the reason you failed.1 2 Was it your fault or was it completely out of your control? You might think it’s the former that would stop you in your tracks but, actually, it’s the opposite. When you attribute the failures you experience to reasons outside your control, you end up performing worse until you start to believe there’s no way to succeed. Then, you give up. If Tom Toro’s story tells us success is the result of adopting the right mindset, then it makes sense that the opposite is also true—failure is the result of adopting the wrong one. But what would happen if you took responsibility for each of your failures—even when they weren’t your fault—and saw them as an opportunity to get better? He used each rejection as an opportunity to get better. Rather than deciding he wasn’t good enough or that no one understood his humor, Tom took each rejection as a challenge to perfect his craft. At one point, he even flew to New York to meet with The New Yorker’s cartoon editor for face-to-face feedback. He realized success was exponential. Tom knew once he had his first break, more would follow. Getting accepted once in 610 tries does not mean that ratio will continue. Each success shortens the time between it and the next. When you adopt the right mindset for success, you no longer see a string of failures as a sign to stop trying. Instead, you see them as a series of data points. Each one contains useful information to help you better aim for the goal. Once you’ve collected enough data points, hitting the target is inevitable. Think of it the same way you would bowling. You aim for a strike, but the first time you roll the ball, you’ll be lucky to knock over any pins at all. It’s only after learning the hundreds of ways to not knock the pins over that you start to roll like a pro. And, once you have your formula, the strikes keep coming. The same is true of any challenge in life. You have to bomb a lot of interviews before you learn how to present yourself in a way that will get you the job you want. You have to date a lot of people to find the right person to spend the rest of your life with. You have to be told no by many customers before you find one to say yes. You have to draw a lot of cartoons to get one in The New Yorker (or so I’ve heard). 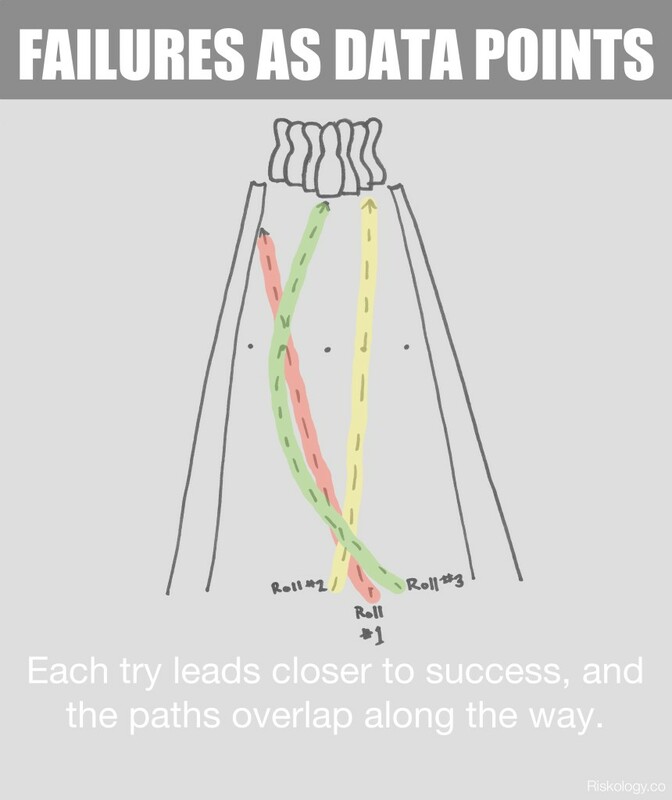 To get to that first win, though, you have to look at each failure in just the right way. And, remind yourself that no matter how many times you get something wrong, if you get just a little closer each try, you’ll eventually get it right. You can see all of Tom’s cartoons for The New Yorker here. Thanks to the stories by NPR and The San Francisco Chronicle that inspired this article.